Apparel manufacturers wishing to become suppliers for major U.S. and European companies must generally be “qualified” by the company before they will be given an order. The qualification process is generally a straightforward effort to determine the capacity, suitability, and stability of the producer in relation to the needs of the buying company. Western buyers seeking a new contract or subcontract supplier may ask potential suppliers for the following types of information. Specialty shops and small retailers buying from small producers may require less detailed information. Number of skilled workers, and types of skills represented. Number of days per standard work-week and shifts worked. Closest port and transport links from factory to port: Frequency of ships calling, ship routing and travel time. Also, if apparel shipped by container, can containers be loaded, inspected, and sealed at the factory gate. Legal status and financial stability: U.S. companies may ask potential suppliers for specific legal and/or financial documents to assess the legal status and the financial stability of a potential supplier. Workplace conditions: Workplace conditions will generally be evaluated by site visit. Such visits may be unannounced, particularly after a potential supplier has been initially qualified. Conditions to be evaluated include (but are not limited to) use of child or forced labor, lighting and ventilation in the factory, temperature/humidity controls, existence of fire or other safety hazards, availability of safety equipment such as fire extinguishers, sprinkler systems, and emergency exits, cleanliness of break areas and toilet facilities for workers, on-time payment of fair wages, appropriate working hours, workers’ rights to free assembly and collective action, and existence of a written company policy manual. Vendor Codes of Conduct: Increasingly, U.S. companies are developing codes of vendor conduct and requiring that potential and current suppliers agree to adhere to the buying company’s code as written, or to other certification such as SA8000 or WRAP. 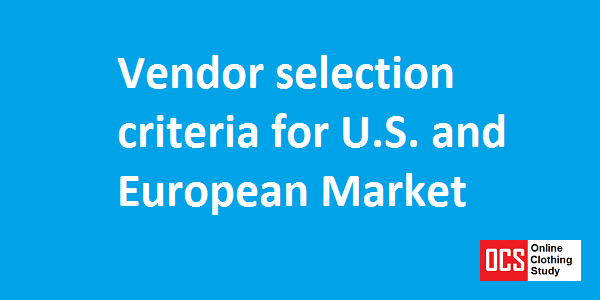 Garment supplier selection criteria in the US and European market.